Doctor Neha: Welcome to TalkRx with Doctor Neha. Today I have a special guest Raheel who I have met recently. He’s an engineer and an entrepreneur doing some incredible work in biomedical engineering. That’s my field so I connected to him immediately. He has agreed to share his communication questions. I just want to start by saying how brave and amazing I think you are. Doctor Neha: Tell me you read TalkRx, yes? Doctor Neha: Tell me what questions came up for you. What have you noticed since reading it? Raheel: I liked how you pieced the different components [body, thoughts, emotions, values, action] together. Personally, I tend to focus on one versus the others. For example, the body is where you kick off. I think that component helped me realize [the connection between] the body and the mind. Part of my background as an engineer is problem solving. I often go into problem solving mode. Where I don’t necessarily always need to solve a problem, sometimes I just need to be present. A lot of times, I’m in my head. One of the examples [you wrote about] was when you see something happen, say, someone breaking into a car, you tell a story in your own head. [The story could be] that this person is robbing the car or this person’s keys are lost in the car—or about anything in between. Raheel: I think [it’s important to] understand when there’s fact and when there’s fiction going on. A lot of the fiction comes probably from previous experiences or movies or something along those lines. Raheel: Heartbreaks. It’s very interesting to understand that your perspective is probably unique from other people’s perspective because of your experiences. So how do you take that out of your head and balance it with the other components like your emotions, like your heart? Then how do you really play with all of that? Doctor Neha: I find that if you’re in a profession like engineering or some sort of a science profession where we have to build and create things right, it’s about solving a problem or making something happen. It’s pretty easy to stay from here up [in our heads]. What was your hesitation of dipping into your heart? What has been your experience of doing that? Raheel: It’s been eye opening, but there’s a natural gravity to go back to the old way. It takes time I think. Doctor Neha: Until it’s comfortable. Raheel: Right, exactly, it’s been programed for so long. Doctor Neha: When you do venture into your heart, it’s only an 18-inch journey, but a long one, right? When you venture there, can you feel the physical sensations in our body? Doctor Neha: What do you feel? What’s a particular physical sensation you feel when you notice you’re doing that or getting uncomfortable? You even told me coming on camera would make you feel uncomfortable. Are you feeling uncomfortable right now? Raheel: I’m good; I’m not even thinking about a camera. Doctor Neha: Okay great. What physical sensations happen when you move out of your comfort zone? Raheel: I think the sensations are the same. I think now I can kind of dissect them better. I have an understanding now that I used to feel anxiety before and I still do today, but now I can kind of understand why it’s occurring and what’s the root cause and start working on it. Doctor Neha: Let’s talk about that. Chapter 15 in my book is called “The Sky Is Not Falling” (a reference to Chicken Little). Anxiety is future thinking. It’s a fear of something that might happen in the future. What’s one thing that you worry about that might happen in the future? Doctor Neha: [Fill in the sentence] What if …? Raheel: I probably shouldn’t say on camera. Doctor Neha: How about something as simple as, What if I try this new entrepreneurial venture and it doesn’t work? Raheel: I actually don’t feel that though to be honest. Raheel: I’m more about the journey and I knew the likelihood of succeeding [in this venture] is slim going into this. Doctor Neha: Are you a little bit of a skeptic? 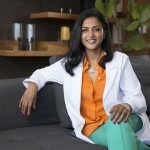 Doctor Neha: …of entrepreneurs that have succeeded. Okay, I’ll give you one. I have actually wondered, I work a lot, I wrote this book. I’m doing the TV show and all these things. What if I don’t find love and settle down. What if my life there’s this piece of it that never quite gets fulfilled while I spend the rest of my life helping other people do that. That’s one of the things that kind of makes me a little bit anxious. The important thing to remember about anxiety is it’s a future-thinking fear. It’s like you’ve gone in a time machine forward and so you miss the present. Either you’re worried about something that’s happened in the past and that it’s going to happen again. Or you’re shifting forward into the future [before any fear has actually happened]. Either way you’re missing the right here and right now. You’re missing this moment and this connection. Thank you, Raheel, for sharing your journey and about how TalkRx has helped your connect your head to your heart—and about anxiety, because I think a lot of people out there feel anxious. There are a lot of people on sleeping pills. There are a lot of people on anti anxiety medication and—I’m not saying that’s you—our society in general, instead of handling what’s at the root of the anxiety, they are masking it and numbing it out. What I really appreciate about you is your willingness to explore your heart and your willingness to learn these new tools. Raheel: Thanks for having me. 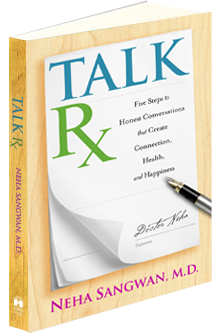 Doctor Neha: If any of you [viewers] notice that you spend a lot of your time in your head or you also notice that dealing with your heart seems like an ambiguous or unclear messy situation, what I want you to know is that in my book, TalkRx, I spend five chapters teaching about how to navigate your emotions. This will serve you in every conversation as well as in conflict, at work and at home or any time there’s some drama—any time you need to navigate your heart, which is everyday all the time in real life. Pick up a copy of TalkRx. There are also some tips on anxiety and how to specifically handle it. Do you tend to rely more on your head or your heart? Which one has more influence on making decisions? How would your decisions change if you incorporated more of your head or your heart (whichever one you typically use less)? If you’d like to send me a question or you’d like to be a guest like Raheel, please send a note or a tweet at #askdoctorneha. I look forward to hearing from you, and I can’t wait to hear what you’re wondering about. Thank you.